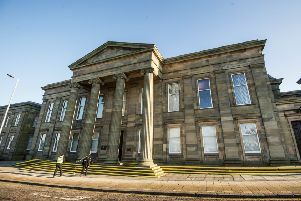 Two men were expected in court today over alleged drugs offences after cocaine worth £125,000 was seized by police near Bothwell. Officers say they stopped a car on the M74 near Bothwell Services on Friday at around 6.40pm, and found drugs - believed to be cocaine. Two men, both aged 26, have been arrested and are in police custody, and a report will be submitted to the Procurator Fiscal. Detective Inspector Martin McGhee, Specialist Crime Division, said: “Teams of officers work every day to gather intelligence and target those who are involved in the supply of controlled drugs within our communities. “We will always look to act upon information provided to us by the local community, who play a vital role in our response to those involved in the illicit supply of drugs. “I would urge anyone with information to contact Police Scotland on 101. Alternatively CRIMESTOPPERS can be contacted on 0800 555 111 where information can be provided anonymously”.